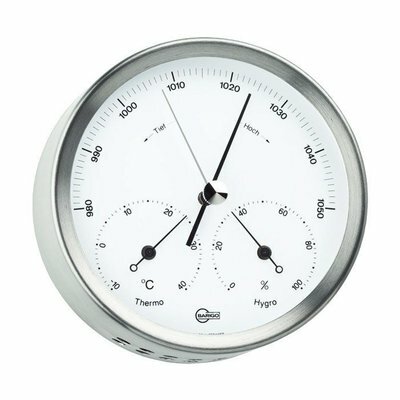 This German-made mechanical weather station uses time-tested mechanical technology to show the precise atmospheric pressure (barometer), humidity (hygrometer) and the temperature (thermometer) without batteries or electrical hookup, for complete autonomy. To be used indoors or in a place outdoors that is protected from the elements. barometer: atmospheric pressure varies with altitude. The factory settings are for sea level (0m), so if you are using it at a higher altitude, use the gold adjustment screw (2) on the back of the barometer. You'll need to use a correct barometer as a guide (for example, the one at the optician's) or a meteorological service (here is a precise map of atmospheric pressure in real time) to precisely calibrate your barometer. the thermometer and hygrometer do not need to be calibrated. 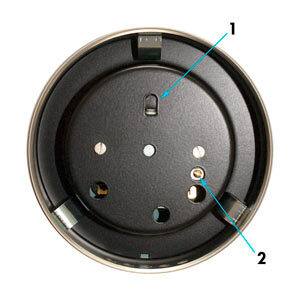 This weather station should be hung on the wall with a small hook, nail, or screw with a width of not more than 5mm, the width of the hole in the back of the case (1). For those who are on the lookout for a sudden change in the weather, the level of atmospheric pressure (especially how it rises and lowers) can be a very useful measure. The needle on the dial lets you easily memorize the pressure level in an instant. A few seconds after you've put the needle in place, you will be able to see any ups and downs in atmospheric pressure (you can tap lightly on the window of the dial to give the needle a little help). Normal variations in atmospheric pressure range between 1000 and 1030 hPa (hectoPascals = millibars): readings above or below this range indicate extreme turbulence. A rapid decrease (in three hours time) in pressure usually signals the arrival of a depression (rain), while a rise in pressure means an anticyclone is in the neighborhood, thus, you can expect nice weather. In 1642, the physicist Torricelli, following up on Galileo's research in the court of the Duke of Tuscany (in search of a solution to a problem with hydraulic pumps) discovers the barometer by filling a tube with mercury. He notices that the mercury lowers before bad weather and that its level varies with the weather. Torricelli's Tube is the very first barometer. Then Blaise Pascal explains in 1648 why pressure lowers when altitude rises. The measurement for atmospheric pressure takes his name: the pascal (a hectoPascal for 100 pascals). We have to wait until the middle of the 19th century for barometers to be produced on a large scale (mercury in glass tubes). Water barometers are also made, operating under the same principle as the mercury ones, then gas barometers. The aneroid barometer was perfected by the French scientist Lucien Vidie in 1844. His "Vidie Capsule", a sort of watertight, vacuum box, contracts and expands according to pressure levels, transmitting the information to a dial via a system of levers and a precision mechanism. This aneroid technology is used in this weather station. compact and functional - with a diameter of 10cm and a thickness of 4cm, this is a weather station that doesn't take up much space. Manual dial needle, no battery, and in the blink of an eye you can be up on the weather! timeless design - stainless steel and acrylic glass, sleek form, white background and shades of black...an object that is plain and simple and can adapt to any interior decor. quality - made in Germany mostly by hand at Barigo, a specialist in measuring instruments since 1926.